Apples are an affordable and versatile staple in the average American diet. Available in a range of varieties that differ in texture and sweetness, apples can add flavor to soups, salads or baked goods, or provide an easy and quick snack to be consumed on the go. Examining your apples -- by smell and sight and feel -- for signs of damage or spoilage before you eat them will help you avoid biting into a rotten apple. When you're shopping for apples at the grocery store, perform an initial quality check of the package can help you avoid a bag of bad apples. Look for a packing date or a "best before" date on the package or bag clip, and select packages of apples with days or weeks before their expiration date, if possible. Look inside the package for obvious signs of spoilage. Wash the apple in cold water, checking the surface for brown spots, indentations or soft spots that might indicate a damaged or rotting apple. Gently squeeze the apple for insight into its condition -- a hard apple might feel dry instead of juicy, while a soft apple might be excessively mushy or rotten. Rotting apples also have a distinct odor -- if your apple smells like vinegar, it has likely gone bad. In some cases, imperfect apples still prove safe for consumption. Indentations and small bruises on and under the skin of the apple are not generally harmful, and you can simply cut away the damaged area and consume the rest. Rotting apples, with brown lesions or mushy spots throughout, however, should be discarded. Cut down spoilage of fresh apples by storing them in the fridge instead of at room temperature, recommends "Vegetarian Times." Some varieties of apple prove more vulnerable to spoilage than others, increasing your risk of having to discard the fruit. 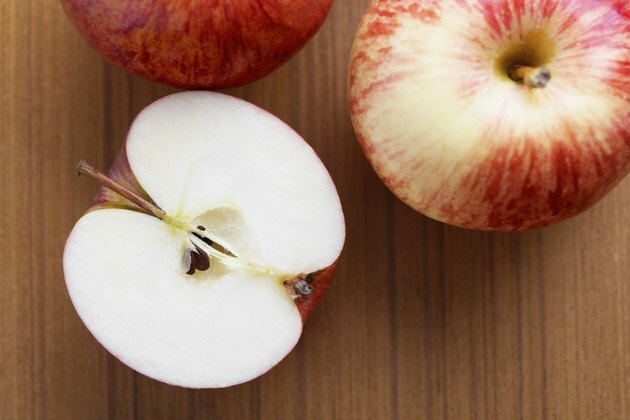 Royal Empire apples, sometimes called simply Empire apples, have a particularly long shelf life, according to Colorado State University, so select these apples to cut down on spoilage. Red Delicious, Fuji, Winesap, Rome, Granny Smith and Mutsu apples also have relatively long shelf lives, reports Purdue University.